Earlier this year, a redesign of the Print Workshop at the Victorian College of the Arts was completed with the creation of separate etching, lithographic and screenprinting workshops to create optimum learning spaces for Visual Art students. Now, thanks to an initiative developed out of conversations between Head of VCA Art Kate Daw and Head of Printmaking Dr Mark Dustin, it will also enable visiting artists and staff at the Victorian College of the Arts to make screenprint editions of works, the sale of which will help fund VCA student endeavours. 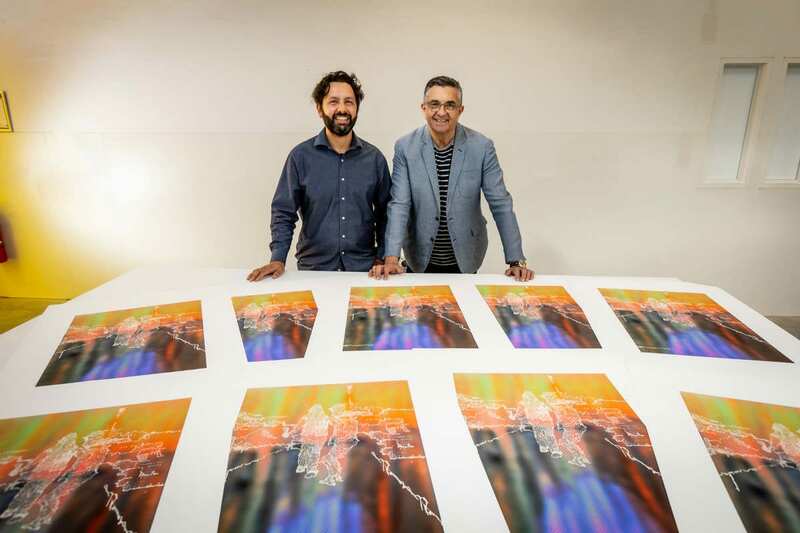 Director of the VCA Professor Jon Cattapan is the first artist to come on board to create a limited edition of prints – or, as he puts it, “the guinea pig” – which he will donate back to the VCA as part of fundraising efforts and to be given as special gifts. The prints are a result of multi-step process. 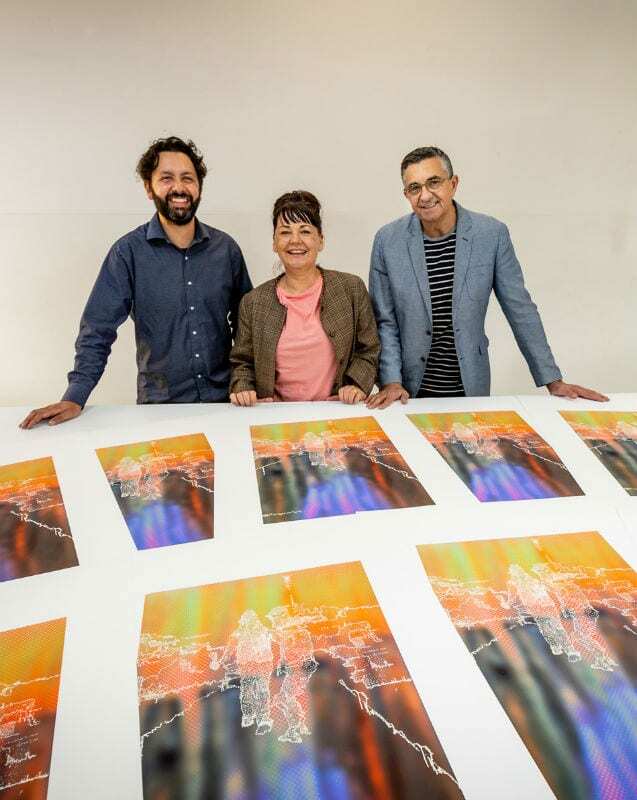 The bright, intensely-coloured background is based on one of Cattapan’s pre-existing works, which he treated heavily in Photoshop before giving to Andrew McLaughlin at the VCA Digital Hub to print digitally. Over the course of two mornings, the white overlay featuring two figures was then individually screenprinted over the top of the digital prints by artist and print publisher Trent Walter, who started teaching in the VCA screenprinting studios in July this year. Trent Walter, Head of VCA Art Dr Kate Daw, and VCA Director Professor Jon Cattapan. Photo by Sav Schulman. Walter says that, after spending a lot of time testing colours – “more than I would have imagined, actually” – they ended up with 26 prints, four of which were rejected. “Because everything’s printed by hand, and because everything’s registered by eye, there are slight variations between the prints”, he explains. The subtle variations between each print will be even more evident once Cattapan has completed the last part of the process. “I’ll be taking the prints to my studio and I’ll work with each one individually to apply just the odd hand-made mark, so every work will be slightly different”, he says. “They’ll still look as if they’re part of an edition,” he adds,” but each one will carry its own unique property”. Having not made a screenprint for 30 years, the medium is not one Cattapan is overly familiar with, but he’s “very happy” with the result. Walter, too, has enjoyed working in the new screenprinting workshop. Banner image: Printmaker Trent Walter with VCA Director Jon Cattapan in the new screenprinting studio. Photo by Sav Schulman.